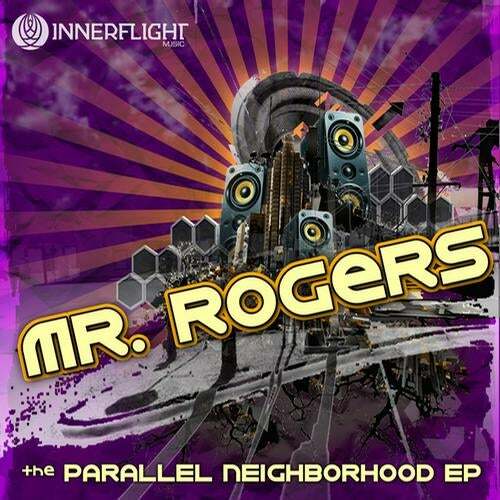 It's a beautiful day in "The Parallel Neighborhood," a lush world of crunkadelic sound brought to you by Mr. Rogers , making his Innerflight debut. The Northern California producer follows his 2008 album release, The Ooze System, with this four track EP overflowing with the bass-heavy, mid-tempo energy and playfulness his production is known for. Everything glimmers from the crisp melodic sheen strutting over a warbled psychedelic bass line on Bird Box to the fractal reflections surging over intricately syncopated pulses and shimmering sweeps on Dynamite Fishing. Entering the Parallel Neighborhood from the East and from the North, Starkey and ill.Gates add their own concoctions to the menu. Philadelphia's Starkey has been earning critical acclaim around the world for his fresh Street Bass sound, which he lays on thick in this Bird Box remix. ill.Gates, well-known for his earlier productions as The Phat Conductor and gaining deserved popularity under his new moniker, drops a low-down, glitched-out bass line into Dynamite Fishing. Blending in distorted vox from Bird Box, he crafts a funky melody that flirts around the bass line like a hummingbird. Deepchild - Love all of these. Spacey, spazzy, bonged-out spud step. Brilliant! Great fun, and top attention to detail.Dev 79 - Starkey heats it up with a grimey thumper sure to please. All the tracks are some tasty bass bits.BD1982 - All tracks sound heavy... Sounding like perfect summer warm up smashers.Ben Samples - I'm surprised I've been sleeping on Mr. Rogers, this stuff is amazing, and not to mention the remixes are out of this world...Akira Kiteshi - Good strong e.p. The original mixes are very good but the remixes will fit better in my sets. Both Starkey and ill.Gates remixes are fantastic!Michael Manahan - This album is great! It's a refreshing take on the mid-tempo tip, nice hip hop an vocal elements, excellent production work and variations on the remixes! I'm sure this will get much play this summer!